Thanks for your nice letter & Card. Hope you had a Merry Xmas, trust the New Year will bring you lots of good health, happiness & success. So pleased to know you are back home again & feeling so much better - congratulations. I fully understand the nature of your operation dear, too bad this was necessary, but its better to have these things attended to & avoid serious trouble in the future - you were very sensible Rita. We too have been having some rain, it was very welcome after such a long hot Summer - quite a relief. No doubt you saw your Grandad during the Yuletide, hope alls well & Happy with him - please convey our love & best. All for now dear. Our love & kind thoughts to yourself & Family. 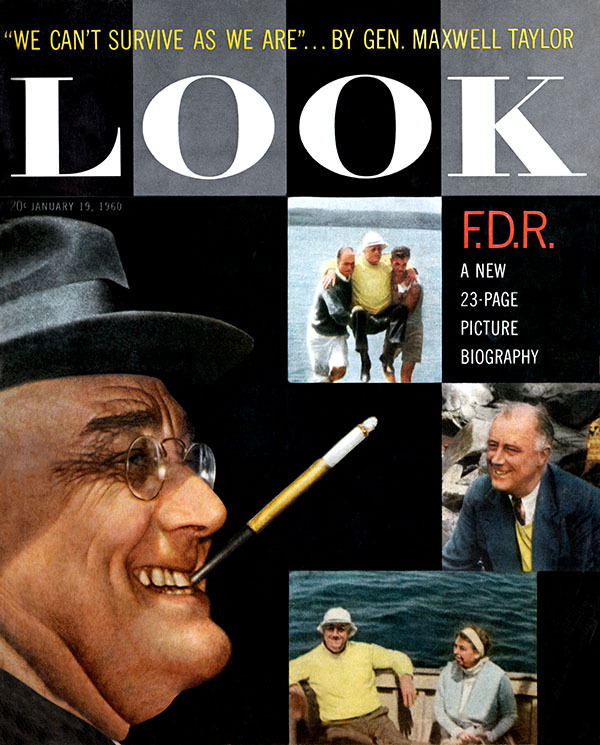 Am looking forward to seeing the article on you in 'LOOK' on the 19th. See sidebar at right for article on actress Lisa Mitchell with mention of her special friendship with Stan Laurel. Hope you all enjoyed a very Merry Xmas & too trust the New Year will bring everything your heart desires. We had a quiet Yuletide, but we celebrated New Years Eve with a couple of friends, a nice dinner at the Mirimar Hotel & later played cards till 12 PM, then toasted in 1960 with a bottle of Champagne, so I was in fine fettle!! My Tape recorder is a Wollensack, I do'nt have any special play-back equipment apart from the machine I do'nt think the sound I get is stereo or hi-fi, its a small portable model, weighs around 18lbs. It records & plays back very good indeed very reliable. Thanks yours with enclosure of snapshot of yourself & family doing a Laurel mannerism - very cute. Hope you all enjoyed a very Merry Xmas. The L&H book is due for publication in March or April by Doubleday Co. Incidently, next month sometime, David Susskind the N.Y. TV producer intends producing a 'SHOW OF THE MONTH' program for the Dupont Co. The story of L&H with Jackie Gleason & Art Carney - hope you'll have a chance to see it. Yes, necessary arrangements were made with us, so we shall receive a Royalty Amount for this - finally we get a little 'Break'. Am enclosing you a recent snapshot - not too good but will give you a rough idea. Again wish you all a happy prosperous '61. Thank you for the nice Card. Hope you had a very Merry Yuletide - wish you lots of good health & a Happy Prosperous New Year. I worked on the same show with W.C. Fields in England in 1910. Glad you enjoyed reading the theatrical biographies of Allen, Cantor, Chaplin & Fields. I too have read them - I have quite a collection of show Bus. Biogs & the ones you mention are included - very interesting to me of course having known many of them personally thru' the years. 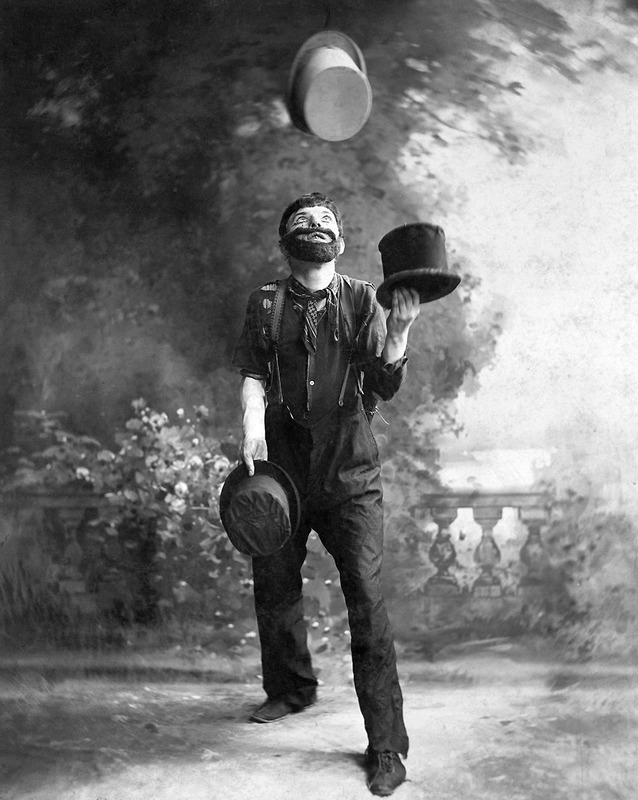 I worked on the same show with W.C. Fields in England in 1910, he was then doing his Billiard Table act & I first knew him when he was a Tramp Juggler. Hope too you enjoyed a very Merry Xmas & that the New Year will bring you lots of good health & Happiness. Thanks your letters of Dec.8th & 12th.the latter with enclosure of 'Daily Mail' article - appreciate you going to all that trouble to get the copy - certainly kind of you. I agree with you the article is'nt too bad, I think its the Headline that gave the people that wrote me about it that impression - this does of course create a feeling that I am down & out & forgotten. Anyway its nothing serious to worry about. Again my thanks for your kindly interest. Trust you had a Merry Yuletide - wish you lots of good health & a Happy prosperous New Year. When you see ‘Blockheads’ you'll understand the reason for this line. Enjoyed talking with you both on the phone the other evening, it was certainly a pleasant surprise & I appreciated your kind thought. I fully understand your not being able to correspond too often, I realise how busy you are taking care of the family, plus your business activities, Pupils & outside entertaining etc. thats a pretty heavy schedule. Am glad to note you are going to get an agent to handle your concert affairs, am sure he can find lots of engagements for you & you will do better financially than you would in getting these jobs yourself, even after you pay him commission - you'll be a lot better off Rickey, especially if he keeps you working steady. Too bad that dame got swacked at the last affair & you missed the 'Overtime' pay. Anyway, it was'nt too bad - you should have suggested to give her another 'Highball' with Alka-Seltzer in it - she'd have danced all night.!!! Note you have a new member in the family 'Jo-Jo', those Marmazette's are very cute - am glad Marie he's 'BETTER NOW'. Incidently, this remark came from an old story: A retired English Colonel who had retired to London from India, met a an old friend in a London Club. The friend asked him about a young chap who had been sent to India two or three years ago for disgracing his Family - he was known as 'Young Wynn'. FRIEND: How's young Wynn getting along Colonel? COLONEL: Oh, he had a terrible time for a while, you see there were no White Women where he was stationed so rather than getting associated with the Natives he decided to Play with himself - consequently he lost his memory.!! FRIEND: Good God - what a tragedy.! COLONEL: No, it wasn't so bad - you see, after he lost his memory, he forgot to Play with himself, so HE'S BETTER NOW. When you see "Blockheads" film again, you'll understand the reason for this line I used when I was in the wheelchair after living alone in a trench for 20 years. I think Rickey you should try & get on a TV show, these appearances would do you a lot of good, these local shows are always looking for good talent, this would be a great opportunity for you & could lead to something worth while. Mention this to your Agent. I would enjoy very much a musical medley on tape, including tunes from the old films, but do'nt bother with it Rickey till you have plenty of spare time. I know how busy you are & I do'nt want to impose on your good nature. Eda joins in love & kind thoughts to you all. Just to let you know, the package arrived safely. Many thanks for your kindness & trouble. No doubt you have heard abouth the new type of Flu epidemic that we are having here, I understand its reaching serious proportions - many thousands under treatment - difficuly is, the Medics do'nt know what to prescribe as yet, so are using the regular methods till they discover a proper remedy. So far, fortunately, there have been no casualties. Hope by now Bus. is improving & your prospects for selling look encouraging. I suffered a slight stroke, but fortunately I made a pretty good recovery and am able to get around again. Of course, I shall never be in condition to work again. Thank you or your nice letter,7th.inst. I appreciated very much your kind thought & sentiments, which you so graciously express. Am happy to know that our old films have given you so much pleasure & enjoyment thru' the years - the incidents you mention bring back some happy memories to me. Yes I am retired now - since '55, I suffered a slight stroke, but fortunately I made a pretty good recovery & am able to get around again, of course I shall never be in condition to work again. Am enclosing you a little picture - thought you might like to have one as a souvenir. Thanks again for your kindly interest, & wish you lots of good health & happiness in the New Year. 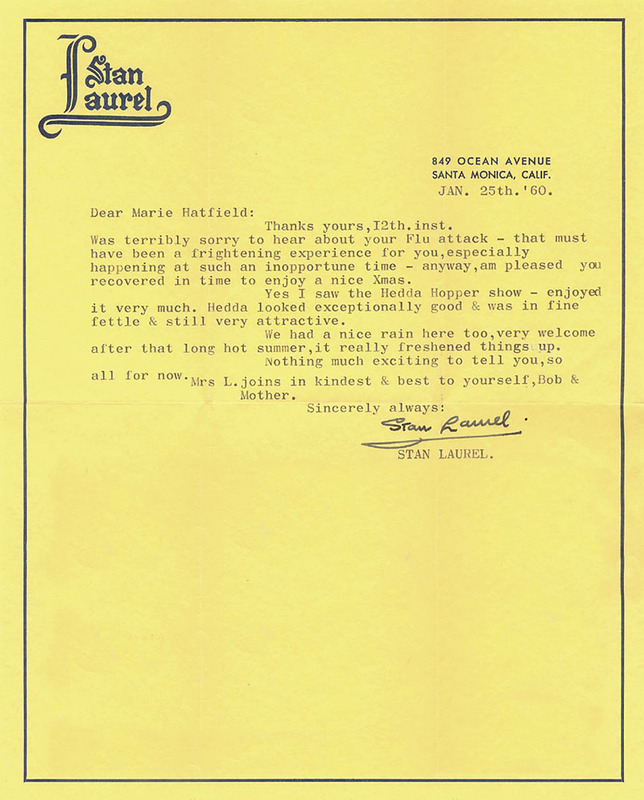 I wrote a fan letter to Stan and received this gracious reply along with a small autographed photo of Stan and Babe. The photograph is now in an archival frame accompanied by an original Hurrell photo of Laurel & Hardy. Many thanks for the nice Card. Appreciated very much your kind thought & remembrance. Hope you had a very Merry Xmas, & trust the New Year will bring you both lots of good health, happiness & Prosperity. Trust alls well & happy with you. Mrs L. joins in kindest regards. The L&H book was in preparation since '54. & completed in '59. I appreciated very much the kind suggestion of your Mother's to write Bennett Cerf in regard to publication, but I am under the impression that Professor McCabe who wrote the book, has already submitted it to that firm - with what result I do'nt know as yet. Interesting to note you appeared in the Stage version of "The Seventh Veil" - I believe I saw the Movie on TV. sometime ago with James Mason in it. I did'nt know you had a flair for acting - this Emerson College should be very good training for you - wish you lots of luck & success Glenn. No, I never went to any school of acting - I was born in a theatrical family & was raised in the business, the theatre was practically my home. My Dad was originally a character comedian who later became an author & producer of plays & eventually controlled about 7 dramatic theaters in the North of England, so consequently I acquired a lot of training & experience first hand, both in Front & behind the Scenes. Yes Mr Hardy made many many films before we met, I too had made many silent shorts. I saw that article you mention in "LOOK" magazine, Lisa Mitchell is a very sweet girl, she visits me often. She certainly holds great enthusiasm for L&H, she knows all the dialogue in our films by heart, its really amazing how she can remember it so accurately & even the title of the film. Bennett Alfred Cerf (1898-971) was a publisher and co-founder of Random House. John McCabe’s book, Mr. Laurel and Mr. Hardy was ultimately published by Doubleday in 1961. Note you saw ‘Bohemian Girl’ on TV. Too bad so much is cut out of these old films. It’s amazing to me that they continue to be so popular, even in this condition. I remember now the news article you sent me about Gleason & Rooney intending to do a film of L&H. Rooney did contact us in regard to the matter some months ago, but being unable at the time to get Gleason he gave up the idea, as Gleason had just opened in a show on Broadway & the length of the run was indefinite, especially that it was a big success & could run for a couple of years or so. Had Gleason been free I think the deal would have materialized as Mickey was very enthusiastic about it, he called me several times in regard to me supervising the story & production - incidently it was'nt going to he our life story - just our characters in a regular comedy film. Am terribly sorry to hear of your health condition Ernie, sincerely hope the check-up & findings will prove negative. The cost of medical attention these days is a shocking situation - as you say, many people die because they can't afford treatment or the high cost of prescriptions etc. the profiteering in drugs is incredible, a bottle of pills that cost 25¢ you are charged 7 to $10. - Govt. investigations prove that. I do know that Babe's year of illness cost over $30,000. they had to sell the home to clear this amount. Was sorry to hear about Neill's estate situation also the trouble with his Sister, but I guess it will eventually be straightened out. There always seems to be great difficulty with inheritance business, it's profitable to the lawyers to keep dragging it out. I already sent a picture to Clarence Langer - no doubt he has recd. it by now. Note you saw "Bohemian Girl" on TV, too bad so much is cut out of these old films - frankly, I do'nt bother to took at them anymore, its amazing to me that they continue to be so popular, even in this condition. Happy to note you had a Merry Yuletide & made the 'Rounds', sounds like you had a wonderful time visiting friends. I understand Betty Healy looked over the property in Miami, Ariz. & is pretty familiar with the town, she too has relatives there who she has visited many times in recent years & from what I gather its quite a prosperous little town due to the Copper industry. I do know the property is pretty old & probably is run-down, but being in the center of town, the land may be of some value in the future. There is quite a land boom in Arizona & they predict it will be another So. California in growth of population etc. I get this information from several friends I correspond with there & are buying all the property they can get as an investment - Miami is only about 60 miles from Phoenix, & is growing by leaps a bounds (Phoenix I mean), so if Betty can hang on to most of the property, she should in time be able to sell it & make good money for herself. That was funny re Madam Queen doing a 'Gracie' down the steps, thats if she wasn't hurt in anyway. Think thats about all for now Ernie - hope to hear from you soon in regard to your check-up. Love & bestest from us both here. Many thanks for your letter of Dec.19th. & Jan.6th.last. Regarding your coughing & soreness at times during a meal Jack, this happens to me occasionally. It seems to happen when I eat dry food, sometimes the Hamburger is'nt moist & other things like that, particularly stick in the throat & causes the irritation - when the food happens to me in this situation, drink water immediately during your eating - I would suggest a glass of Beer or a couple of tall stiff Highballs, then you'll swallow like a Pelican.!!!! Its something to worry about Jack - maybe you eat too fast. Note you are doing a lot of walking exercise, but do'nt overdo yourself, you mus'nt exhaust yourself, just take it easy - when you tire walking, sit down for a while & then play some Ice hockey or a couple of rounds of tennis.!!! Sorry Jennie you are having 'Help' trouble again - thats a difficult situation - know how discouraging it is. I still feel you would be a lot better off to get foreign help through the Immigration authorities, they would be very grateful for the opportunity to find a good home. Am sure there are plenty available. Was terribly sorry to hear about your Flu attack - that must have been a frightening experience for you, especially happening at such an inopportune time - anyway, am pleased you recovered in time to enjoy a nice Xmas. Yes I saw the Hedda Hopper show - enjoyed it very much. Hedda looked exceptionally good & was in fine fettle & still very attractive. We had a nice rain here too, very welcome after that long hot summer, it really freshened things us. Nothing much exciting to tell you, so all for now. Mrs L. joins in kindest & best to yourself, Bob & Mother. Hedda Hopper (1885–1966) was an American actress and gossip columnist, whose long-running feud with friend turned arch-rival Louella Parsons became as notorious as many of Hopper’s columns. 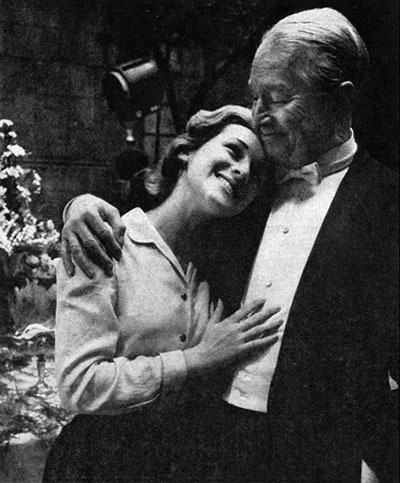 On January 10, 1960, a TV special, Hedda Hopper's Hollywood, aired on NBC. Hosted by Hopper, guest interviews included: Lucille Ball, Marion Davies, Walt Disney, Bob Hope, Debbie Reynolds, James Stewart, and Gloria Swanson. Girl students in Hollywood often keep one eye on their books and the other on opportunities to get a glamorous job. 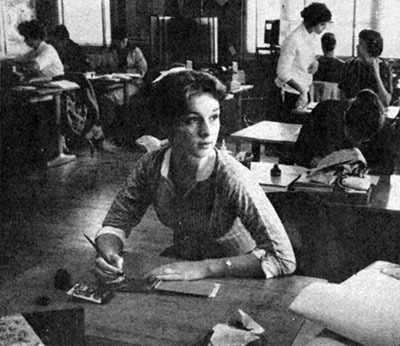 One of them, Lisa Mitchell, needed money to complete her studies at a Catholic girls' college. Lisa landed a four-month stint as one of ten dancers in “Can-Can,” at $300 a week. Picked from 100 applicants, she says. “They almost let me go when they learned I wasn’t a professional dancer. Miss Mitchell has lived in Hollywood most of her life and has one special friend and idol: Stall Laurel, the thin member of the onetime Laurel and Hardy comedy team. She visits Stan regularly in Santa Monica, where he lives in retirement, and sits with him as she re-enacts the Laurel parts in the old comedies—and Laurel plays Hardy'’s.